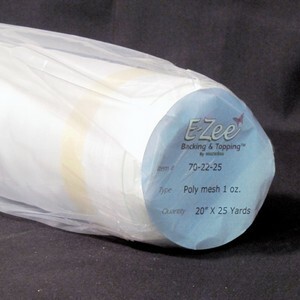 E-Zee Poly Mesh 1.5 ounce is a low profile, 100% polyester woven backing . Use it to prevent show through on white or light garments. Also recommended for designs with narrow columns or points. Use with a lightweight Tear Away for best results during the embroidery process. Cut a piece from a roll of E-Zee Poly Mesh and a piece of E-Zee Tear Lightweight 1.0 oz. backing appropriate for your design and hoop size. To hoop, place the Tear Away backing down first, then E-Zee Poly Mesh and place the garment on top. Embroider the design and remove the embroidered item from the hoop.Tear the excess Tear Away backing away first. Trim the excess E-Zee Poly Mesh backing with scissors.